House of PainT Festival of Urban Arts | 10 Years Strong! featuring: DJ Afrika Bambaataa, Big Daddy Kane, Bboy Ynot, crew Bboy Battle feat. The Souljazz Orchestra (live 'Bboy Suite' final), D’Bi Young, Zaki Ibrahim, 100+ Graf Artists, Live Sneaker Art, DJs, MCs, Poetry Slam, HOPX Conference, Art Show, Hey Kids!, workshops and so much more. awesome all-ages and community based event! with the One World Film Festival. House of PainT, Canada’s Hip Hop festival, is scoring high this year with a 99% all-Canadian line-up! Shad? Canadian. Maestro? Canadian. Radio Radio? Canadians. Flight Distance?...Well, you get the picture. across Ottawa have submitted work for the show. The lucky winners will be selected and announced in the next couple of days, with their work presented at Fall Down Gallery. Linking with this year's festival theme "Build", we're focusing on the changing visual landscape of a city in transition. @ Fall Down Gallery, by donation, 8pm-1am, Thursday, September 13th. Grand Slam 500: A spoken word poetry competition where 12 top ranking poets compete in a never before seen slam style where every audience member will have the power to decide the fate of the winner! With special guest judge: MAESTRO FRESH WES! @ Shopify, $10, 7-10pm, Friday, September 14th. 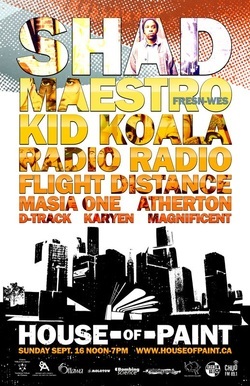 All-Canadian hip hop concert line-up: Shad, Maestro Fresh Wes, Kid Koala, Flight Distance, Masia One, Radio Radio, D-Track, Atherton, with DJs Killa Karyen & Magnificient. 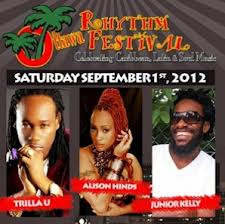 The Ottawa Rhythm Festival is an outdoor music event celebrating the best in Caribbean, Latin, and Soul music from around the world. Featured artists include Congolese superstar Awilo Longomba Canada's Queen of Worldbeat, Ms. Lorraine Klaasen (from Montreal), Toronto gospel artist Sarah Kariuki, Ottawa singer-songwriter Nambuusi "Rita Carter" Kyeyune and many others. educational component. 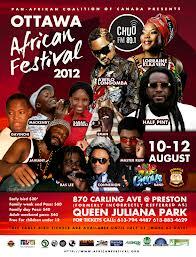 The goal of the festival is to raise awareness within the mainstream Canadian community about Caribbean and African History and Culture and also to unite the Caribbean and African community by educating both communities on their shared history and culture. • Short educational/informative presentations on social/economic/political/ geography/business/tourism/ etc … of Africa and the Caribbean. • Arts, foods, music (Live entertainment, local artists, DJs, steel drum performers), Fashion, Sporting events, Face painting, Midway Family fun park, Vendor’s Exhibition and Cultural Dances. • Representation of African communities by their leaders and or by diplomatic staff. 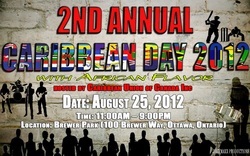 • Networking between Caribbean & African entrepreneurs and public figures.